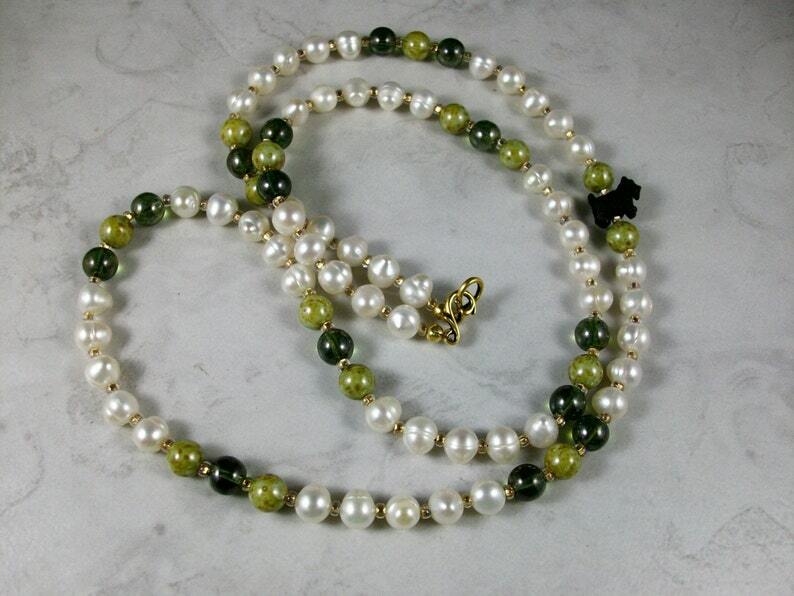 Simple, classical and elegant, this 30” rope of 8mm creamy white fresh water pearls layered with triads of vintage Czech glass marbled leaf green beads is accented with one innocuous 14mm black 3-D Scottie. The pearls and glass beads are spaced with gold foil lined seed beads and closes with a simple gold vermeil hook and eye ring. The matching Scottie earrings dangle 1 ¾ ” (44mm) from the gold filled leverbacks. This is a timeless classical design that will take you from work to and evening on the town.